Re-imagining an historic gymnasium and athletic complex as a regional performing and fine arts center. 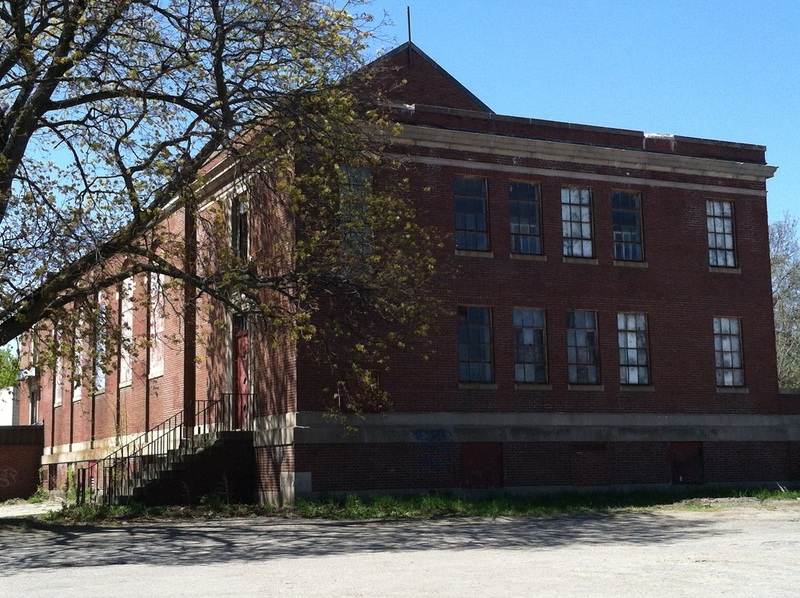 There's an old red brick gymnasium building in Waterville. The old Boys' Club. Once part of the old Colby College Campus. It's in disrepair, the roof leaks, and the gym floor is destroyed beyond repair. More modern add-ons to the old brick building are ugly and contain two swimming pools that cannot be used. Because of the current sprawling add-ons, parking is tight. The once large, arched windows have been sealed up. The gym is nestled in a triangle of land between College Avenue and Main Street. I can envision something crazy and awesome. See aerial view/map below. 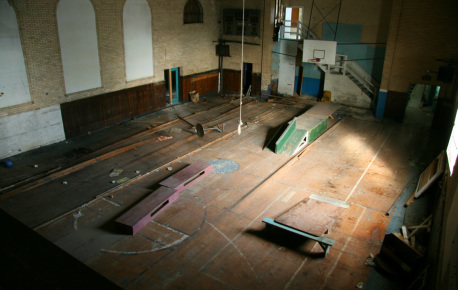 The City, or maybe some non-profit organization, would buy the old gym for less than the current $160,000 asking price, since it's just a decaying tax burden to the owners. Then you'd raze most of the contemporary add-ons, fill the swimming pools, and make that parking lot. 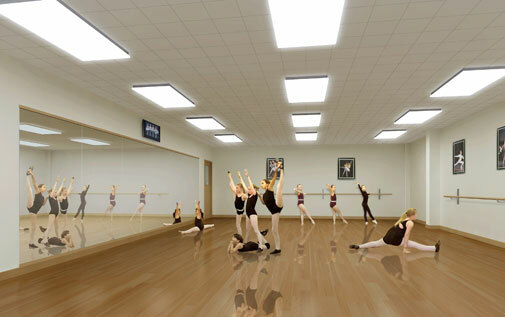 Then you'd build a theater-in-the-round in the main gym space, looking something like the photo above. 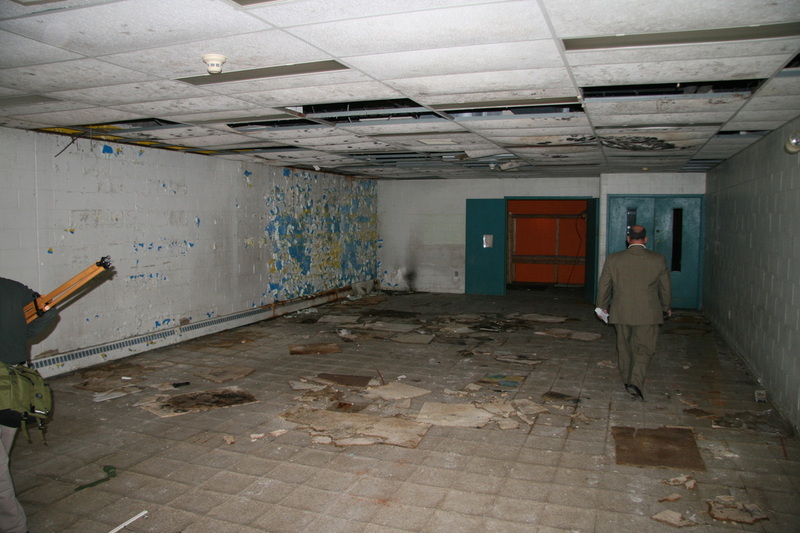 The venue would be a performance space for classical music and jazz performance. Small acoustic rock and folk music would also work well. From soloists, duos, trios, quartets, quintets, and octets, up to jazz bands of 18 or so, it would be the ideal space. 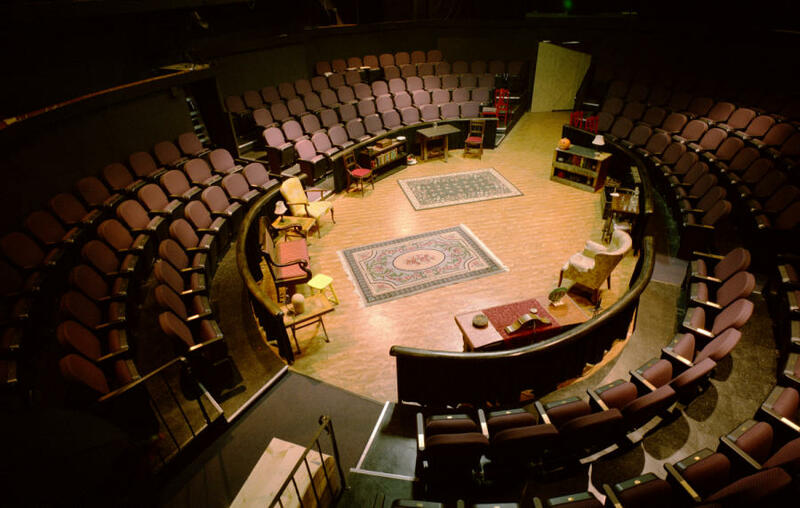 Such groups often play facing each other, so a theater-in-the-round would provide all audience members with a view of somebody. If you wanted to get really crazy, the stage floor could rotate between movements or numbers. You probably don't want to have it in constant motion and make anyone heave. Being located in Central Maine, near the Turnpike, near downtown dining, and halfway between the homes of the Bangor Symphony and the Portland Symphony, I would hope to draw smaller ensembles made up of symphony members to perform. And maybe host performances from the jazz and classical orchestras from Colby College. And provide another venue for the Atlantic Music Festival. I'd also hope for it to be an inland venue for musicians from Rockland, Rockport, Camden, Bath, Brunswick and the rest of the Coast. Small plays who wished to try an in-the-round setting could also play here. We could also simply try to get everyone who stops at Jewett Hall at UMA and at Unity Performing Arts Center to also make a stop here. And finally, if we put a screen on one wall, it could provide a THIRD location to screen even more movies during the Maine International Film Festival. The red brick, multi-story area on either end of the building would be retained as pre-performance preparation space, dressing rooms, rehearsal rooms, possibly space for independent music instructors to meet with students. Also, on the other end, for ticketing, concessions, and lobby. The project may be eligible for a multitude of grants applying to the following categories: historic preservation; downtown revitalization; and performing arts/music. And boy, we'd need some grants - but not from the government. The government is broke. From private foundations. We'd need a new roof, acoustic engineering, the right sloped seating design and arrangement, and preferably great overhead lighting. Perhaps it could be managed by and in the same manner as the Waterville Opera House - sort of "Opera House West"? My proposed name, Gymnopedie, is a play on words over the building's history as a gym and Erik Satie's famous trio of pieces for piano, Gymnopedies. And yes, amazingly there is at least one example of a successful similar project. Check out St. Lawrence Arts' amazing rehabilitation and conversion of the historic and dilapidated St. Lawrence Church. See below for more concept photos and slideshows of the current exterior and interior. The site is located in a potentially mutually beneficial area. Right next to Dunkin' Donuts, Burger King, and the Railroad Square buildings, which house Buen Apetito and Grand Central Cafe. I should expect Gymnopedie patrons would frequently visit these businesses before and after shows. And if it were adopted as a third MIFF screening location, then its proximity to Railroad Square Cinema would be synergistic. 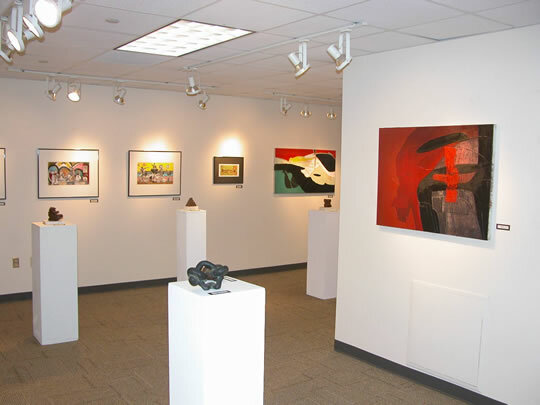 Gymnopedie would draw people to the core of Waterville, and be an attractive venue for visitors and performers alike because of its proximity to downtown dining and other activities. 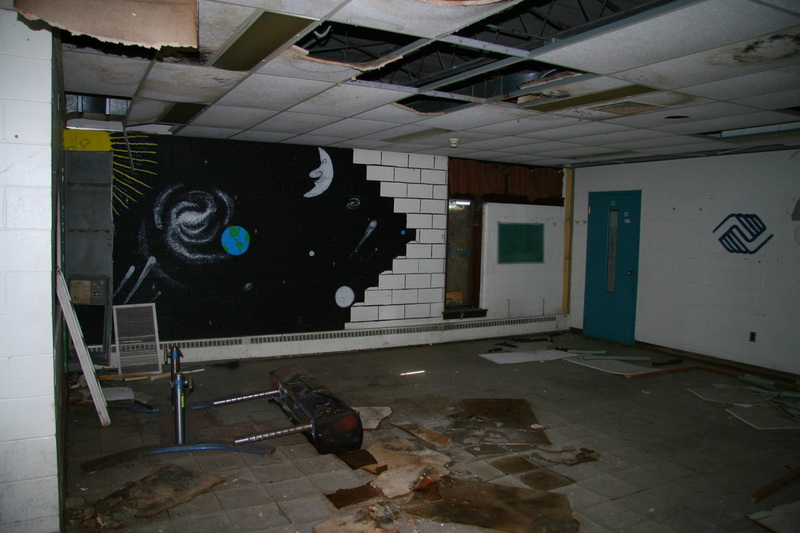 On August 29, 2012, I got the opportunity to view the inside of the sprawling Boys/Girls Club buildings, the giant empty swimming pools, and the main gym space. It was simultaneously fascinating, sad, inspiring, and slightly terrifying. It was pitch black in most of the building and we navigated with flashlights. Most of these photos were taken with flash photography - brief blasts of light in the smothering darkness. I felt like Gandalf in the Mines of Moria.